Barry S. Cohn studied pottery for 15 years under Lloyd G. Reiss, master potter. Barry has owned the Clay Art Workshop since 1993. His love for pottery and for teaching has brought him and his students great success and pleasure. His teaching philosophy allows each student to discover the artist within. 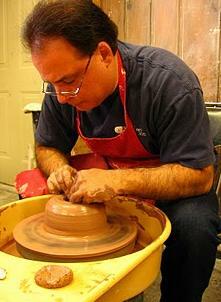 He teaches ceramic arts with a “hands-on” approach so that each student can unearth their own artistic expression.